After the summer break I shifted my focus from full-time gemmatextile clothes to being in my husband's chair repair workshop. I've been developing my own gemmatextile business for a few years and I'm terrifically proud of what I've achieved in that time. The designs themselves will always be an evolving beast but with my own product testing, and feedback from lovely customers, the core garments are better than ever. At all of the fairs I've done, there have been online friends and my own textile heroes to meet. I noticed that at all of the events where I took along one of my small artfigures, they were very appealing to 'my people', and I've had some lovely chats about my creative journey to where I am now. Over the last few months my early morning worktime has been dedicated to creative textile work. Allowing myself this little window back into textile art has brought some of my textile obsessions together and led me to learn about handweaving. Another time-hungry pastime! 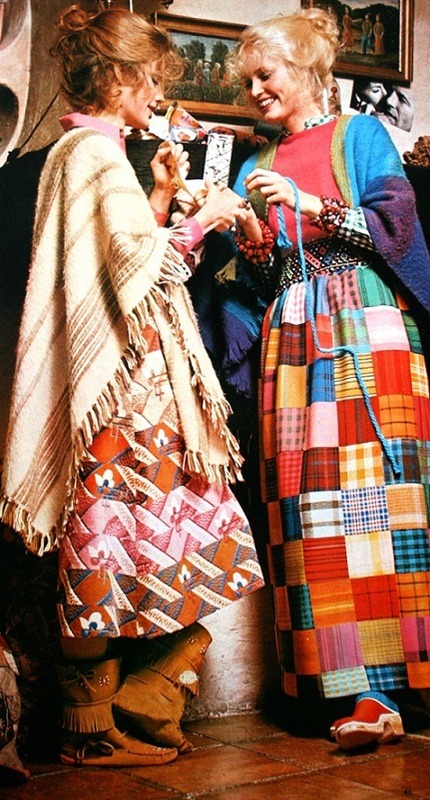 If I get a loom system that I'm happy with I'd going to try to make my own cloth to embroider and even make heirloom garments. I don't know how conscious this shift in my creative journey is but there is a nice synchronicity with being drawn back to Mark's workshop. As well as adding to my own understanding of materials and slow work, I shall bring some gemmatextile social media wizbangery with a new Instagram account @chaisesrecannees for the chair seating. While I need to spend some time working in the family business, I shall continue to add more items to my online shop. 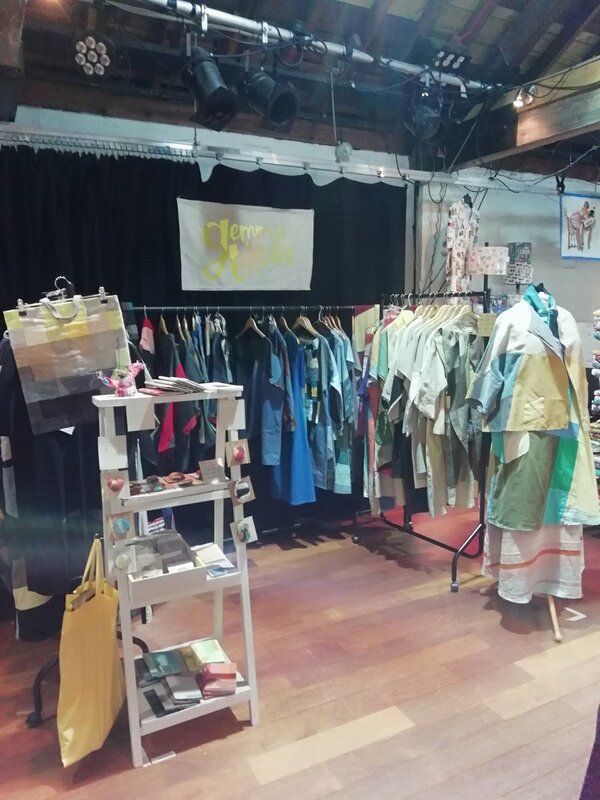 A little over two years ago I started the Gemma Textiles Clothing project. Originally it was just a personal thing, trying to rationalise and stylise my own wardrobe. I ended up remaking and making from scratch lots of new designs because I couldn't find what I wanted on the high street. The best of my designs, were refined and experimented on, resulting in the dozen or so garments I regularly make now. I do of course, mostly wear my own makes, some of them the original toiles, some I've stolen from stock. The old favourites, get worn and worn again, and I've ended up with nearly all of my wardrobe staples in the 'needs mending again' pile. These are my prototype Yana trouser, a basic remodelling of an A-line skirt. Scrunched up from the mending pile, worn thin, patched, and as my figure has 'relaxed' over the last year, they're uncomfortably tight. My latest design development uses an elasticated waist, so my originals are going to be patched, added to down the sides and given a comfortable elastic waistband. New Yana in naturally dyed linens. The last few years has found me learning lots of new skills, struggling A LOT with some of them, trying desperately to acknowledge success where I find it, and scrabbling around in the depths of my artist brain for motivation to keep a tiny business going against the tide. What has kept me going, is a love of making something, anything. The original obsession that fuelled my clothing project was being able to sculpt coverings for the body to find a new, grown-up identity. This inevitably resulted in ideas beyond my ability, leading to the time gaining new skills, these in turn give birth to new ideas that are 'good enough' to work on, and it's these ideas that become The Plan. The next year will be focused on building Gemma Textiles online, taking pride in the Gemma Textiles 'look' and making a small business that will sustain itself and me into the future. 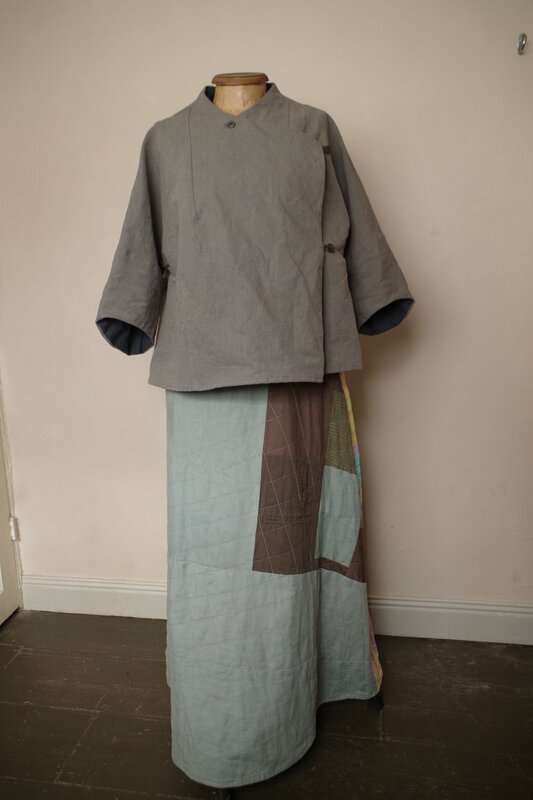 My jacket and dress designs are sold in 3 sizes at the moment. Because these don't immediately relate to dress sizes that customers are used to, as I list things in the webshop I try to include real size information. This comes in the form of 'flat-lay' measurements. I'm also playing around with some design sketches that I can write the measurements for each garment on for each listing. The way I piece my garments, and the different fabrics I choose means each garment is quite unique and even when cut from the same size pattern, one will end up slightly different to the next. The necklines and pockets are mostly decided on after I've pieced front and back and decided which will be which. I believe strong women deserve characterful clothing, so the journey through choosing colours and fabrics and allowing each dress to evolve while it's being made, is one I enjoy every moment of. Having made an unexpected pink dye from a batch of willow, I've put together my procedures here for comparison with more tests when I have enough cloth ready. I'm not ultimately interested in pink for making clothes, but others may be interested and it could be useful to have some alternative colours for making my collage appliqués. I'm not sure of the variety unfortunately, I'll photograph it in situe to show it's growing habit next time I'm at the allotment. In May I made dye with 630g of leaves and green, soft stems. In this I dyed 71g cotton with no mordant (already sewn into a garment) and 165g of linen yardage mordanted in 5% aluminium acetate. The unmordanted cotton took a lovely yellow but is very pale, the mordanted linen took colour very well. Both these were simmered in the dye for an hour and left to steep overnight. Once they were removed, I put in 165g of cotton mordanted in an acorn tannin bath. Although this was dyed overnight without heat, it took a nice yellow colour. The photo isn't a good capture of the colour, the bottom, linen piece is paler and more mustard than ochre. The top, cotton piece is a nice buttery yellow. This month, the willow hedge got another trim and I ended up with 1.150kg of leaves and soft green stems. As I don't have a pan big enough to cook all that in one go, I did approximately half, simmering for an hour, then steeping overnight. The next day I strained out those leaves and put the second half into the same dye pot. This lot got simmered for an hour then left to steep overnight. When I strained the dye the next day I wondered if there might be colour left in the leaves as there had been quite a lot of plant material to the amount of water. 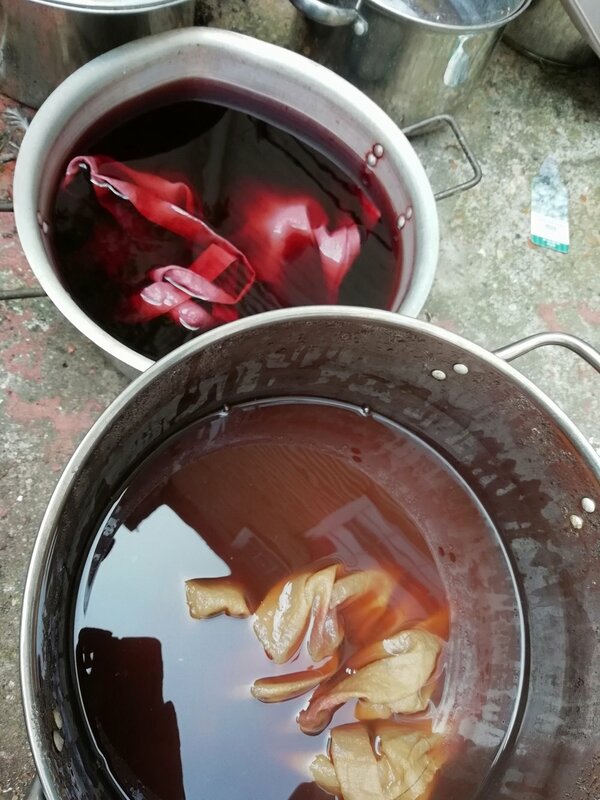 Leaving the first lot of dye stored in one pan, I covered the remaining 550g of leaves with water and left them overnight. They only had a small amount of heat put under them because I was short on time, probably only enough to raise the pan to a simmer, then they were left two full days steeping. I was planning to combine all the dye for lots of lovely yellows, but in this second cooking I found a deep pink dye. These are the two dye pots together. All of the dye was made in stainless steel pots. The yellow was stored in an aluminium pot while the one that ended up pink was steeping in a stainless pot. The pink was strained into an aluminium pot which is the one that I dyed cloth in. 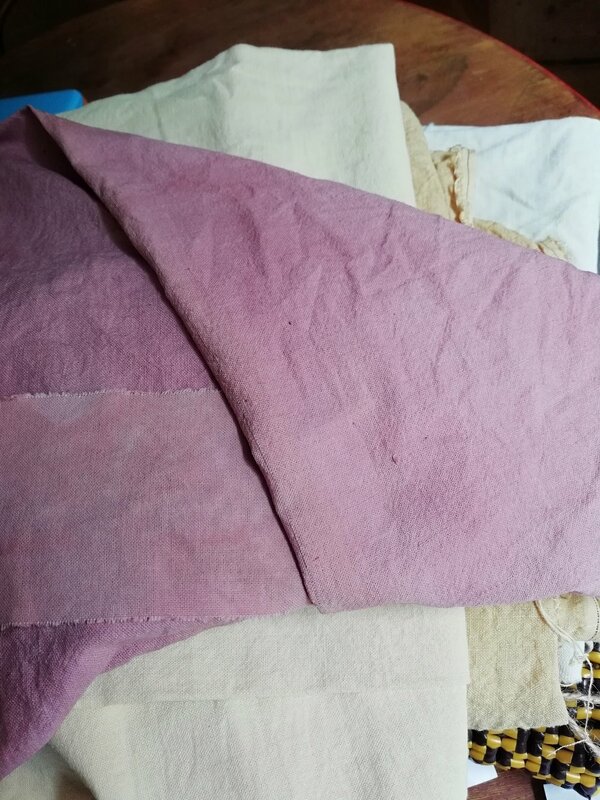 Into the pink dye I put a cotton sewn up tote bag with no mordant and a strip of cotton that had been in my acorn tannin bath. 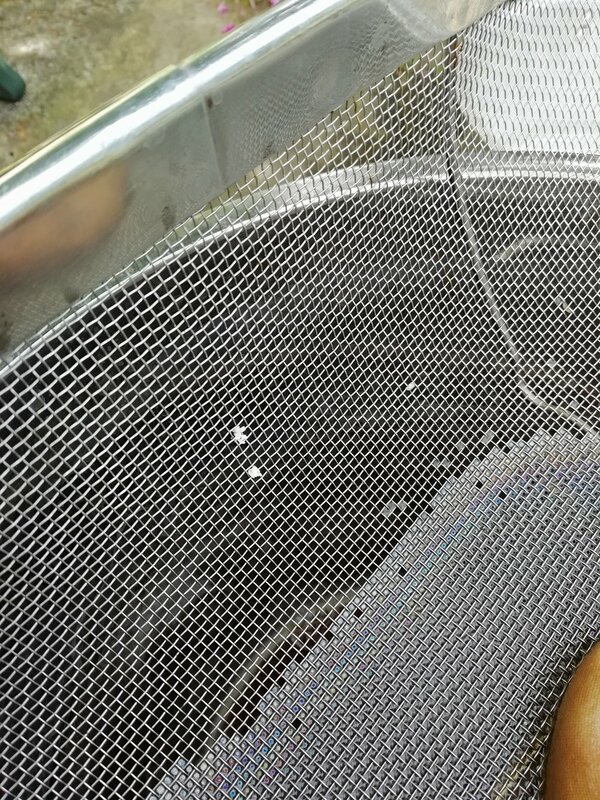 They had gentle heat applied for about half an hour then were left to steep overnight. The colour is not quite as rich as the photo, but it is a lovely soft blackcurrant sorbet shade. There is very little difference between the cotton with and without mordant. The yellow pot dyed a piece of linen mordanted with my acorn tannin bath a deep ochre colour. Where the cloth was sticking out of the dye after I turned off the heat, it turned the pink colour. I immediately removed the cloth from the pot and hung it up. No further oxidation took place. 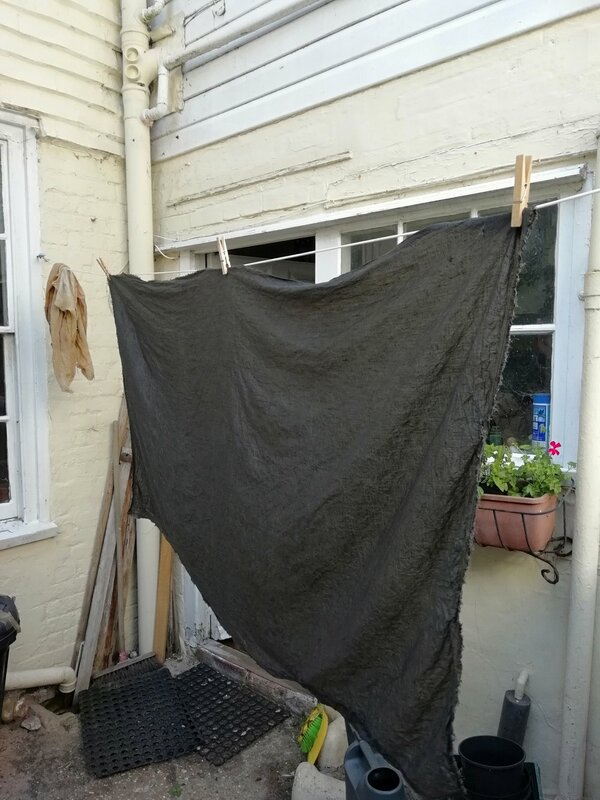 As this ochre colour isn't one I want to work with, I put this cloth in an iron bath, and now have a beautiful deep shade of grey. Happily the iron bath has almost completely evened out the pink splotches. To make the most of my remaining dye, there's an unmordanted piece of heavy linen in the pink pot, and an arms length of linen about to go in the yellow. I would be interested to hear your comments on the pink dye, I plan to reproduce the same process to see how the colour developed. I have a slow-learning project to experiment with natural dyes. If you follow me on FB or insta, you'll know that every few months I get out my pans and cloths and get myself all excited. It's taken me a few years to hone down what I want to focus on, and which of the many variables I need to really understand if I'm going to achieve reliable and desirable coloured cloth. I concentrate my studies on cotton and linen. I use organic cotton or secondhand, and good quality linen. Linen is a much more sustainable cloth than cotton, needing less water and pesticides when it is being grown. Today I've started brewing a pot of willow dye from hedge trimmings. My test for this batch of dye is to compare mordant. 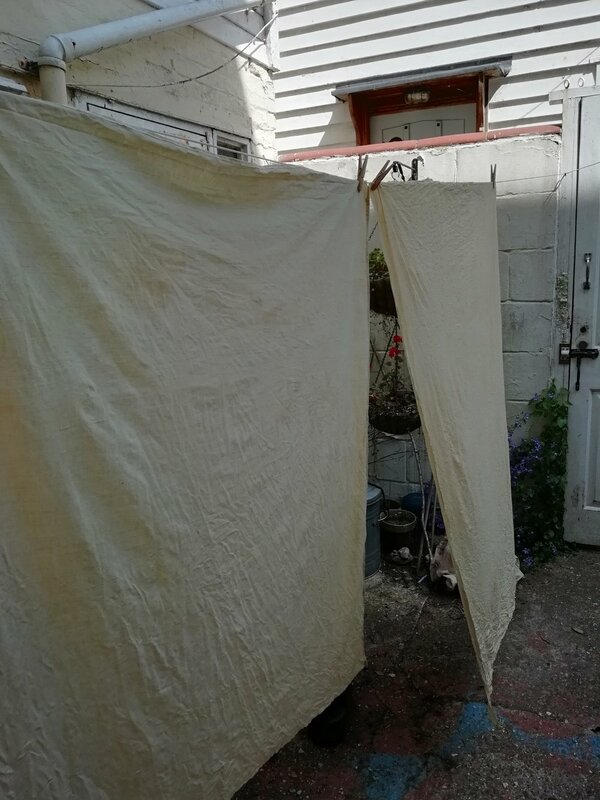 In previous weeks I've dyed the same linen in willow with an aluminium acetate mordant, no mordant on cotton, and after a dip in a tannin bath on cotton. My tannin bath, arrived at accidentally because I left a bag full of acorns in a covered bucket under the stairs all winter. When I rediscovered it, I strained the rotting/fermenting acorns out and retained the stinking liquid. In between times, the liquid grows more, well slime, which after straining it out, I get a nice even covering on the cloth. The liquid is very attractive to flying insects, and whilst I was doing my dipping, a wasp came and laid eggs on the straining cloth. Although I was nervous of getting in its way, an amazing thing to witness. I'm going to try drying out the slime to see if that also contains useful tannin. I'm wondering that if I transferred the liquid into a poly in sold for home brewing, I could exclude air, and maybe halt the slime growing and save myself the trouble of straining the liquid each time I want to use it. Apart from finding people who understand the value of hand-made work, achieving a zero-waste workshop has been one of the biggest challenges for my business. 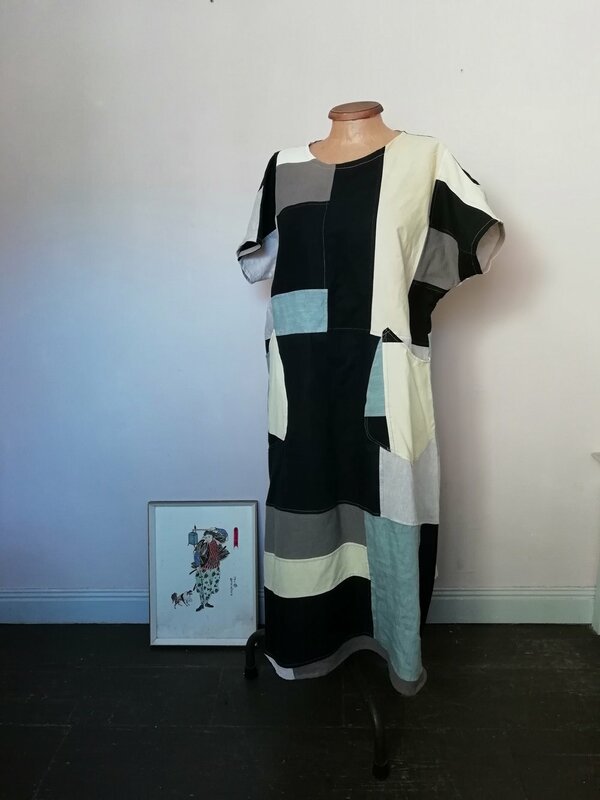 Those of you that are familiar with my work will have an idea of my starting point, but for those that are new to Gemma Textiles I make clothes and accessories from post-consumer waste. That's just a snazzy way of saying second-hand clothes! There are an increasing number of designers globally who are using similar materials but with the scale of my business I use charity shops, jumble sales, hand-me-downs and my own family's discards. 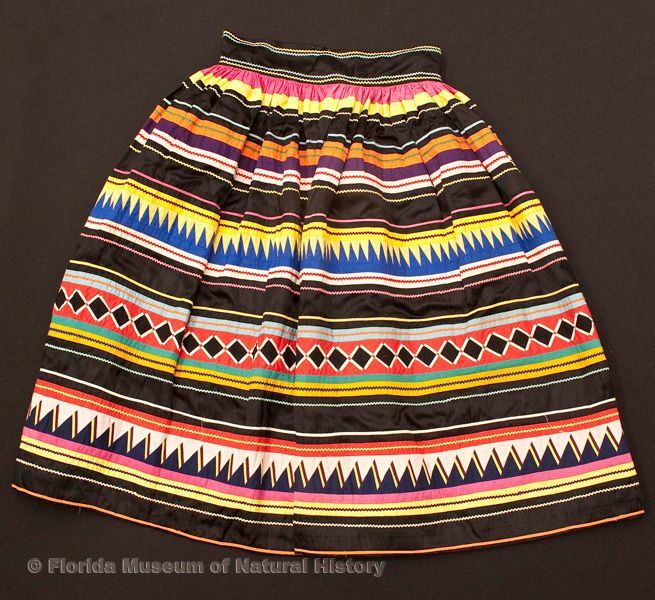 The largest sections of this material are used for my garment designs. The remnants are kept for feature details or one of my scarf designs. The smallest and nicest left-overs are used for my 'Scrapscape' and 'Portable Art' projects. At the moment I sell my brooches and Efi Scarves through my Etsy shop. You can take a look here. Even with this process of utilising smaller and smaller pieces, over time I accumulate scraps that it's too time-consuming to incorporate. My latest scrap buster project has come out of a need for a new loose cover for our main sofa at home. I decided to make new seat cushions at the same time to make it into a much comfier sofa. I did look at the price for nice new upholstery fabrics, but with a two metre sofa and an economy mind-set I opted to use what I already had in my home stash. In this case, that ended up being two very colourful and clashy fabrics, so to make a statement and help bring the project together visually, I decided I'd make some multi-colour piping, also from my saved scraps stash. I've never used or made piping before, but with a new 'piping' foot for my machine, I was really excited by the process. Any excuse to buy new equipment is always appreciated! I'd read that the best piping is made from fabric cut on the cross so that it goes around corners and curves nicely. To achieve this I cut my squares in half corner-to-corner then sewed them together short side to short side into a strip. It would have made the final job easier if the original squares had been slightly larger because my seam allowance on the finished piping was a bit narrow in places. I used 8cm squares (cut in half) around 5mm cord. The bulk from the seams of the triangles obviously took away some of my width when putting the piping together. Even though this process was very labour intensive, I was really happy with the results, and it's a super way to use quite small scraps. The last scrapbuster element in this project was the new seat cushions. Again, wanting to find the most economic option whilst not compromising in comfort, I opted to buy 5cm deep feather filled box pads, and to make my own 5cm deep box pads filled with waste from my 'unuseable' scrap bin. 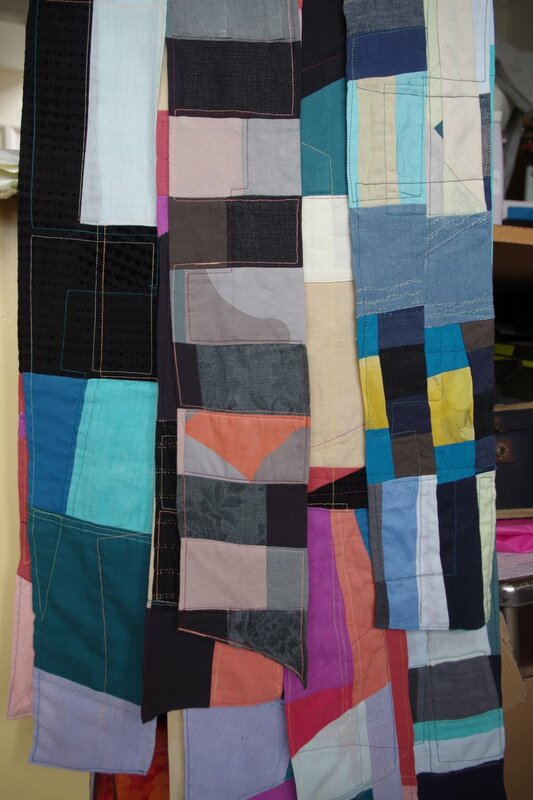 This scrap contains all the seams, waistbands and tiny, fiddly shapes left over from all my garment making. It's quite a lumpy material on it's own, but underneath the feather topper, it makes a nice, solid base for the new sofa seat. A set of these two inners went into each new cushion cover reclaimed from the previous loose cover. I haven't yet researched the commercial applications for this type of scrap as cushion filler. I would be uncertain that it would pass commercial fire safety regs in its raw form, but I'm certainly happy to have used it for my own project. I rarely go bare-legged, and I really love wearing trousers but occasionally it's cool to wear a skirt. Here are some reasons why. Even when you love what you do, when you take a break to recharge and be with your family, it's possible to loose momentum, and this is when running a one woman business needs extra energy. For me, the most exciting part of making clothes is choosing the colours to put together. I never have enough fabric to choose from (of course), but sometimes having a preset limitation can stretch your creativity. 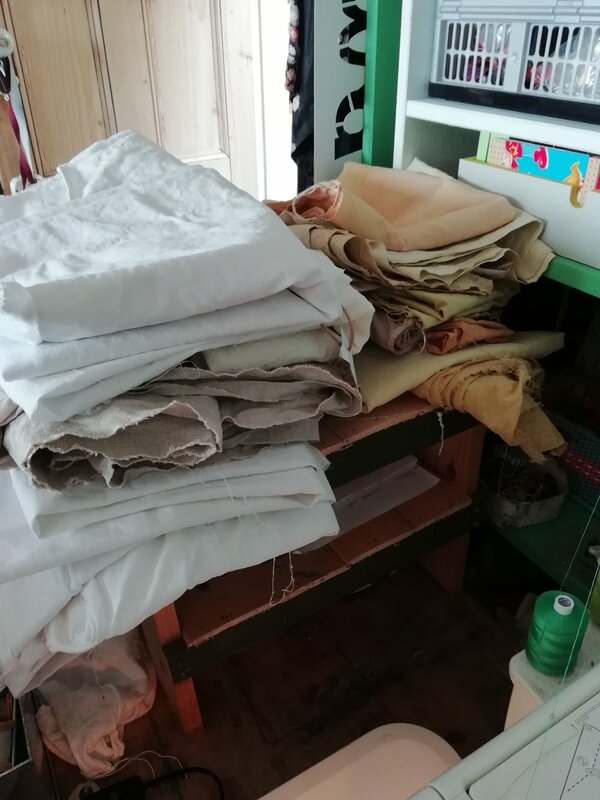 From a big stockpile, and having decided which garment designs I'm planning for, I would first need to select an appropriate weight of fabric, then I can play around with the colours. I have some classic colour combinations that get me excited, often it's a dark with a bright, or bright with sombre combination. Building on that, there is great joy in creating combinations of colours. I don't have strict rules, but it's a similar process to how I would put together different colour garments to make a satisfying outfit. The more colourful and eye-catching of the Gemma Textile garments make a good starting point for a special outfit. I hope to add some versions of the popular Gemma Textile designs in plain colours to my range in the future, so my different designs can be combined without patchwork overkill! The twists and turns of life have led us to own a little piece of ordinary heaven in Lower Normandy, France. It's ordinary because the house itself is not picturesque or luxurious. The land and the barns had deep layers of rubbish under the very human process that is neglect. It's heaven because it is. The skies are full of stars at night, and birds during the day. The undergrowth is full of snakes, toads, dormice, foxes, deer, badgers. 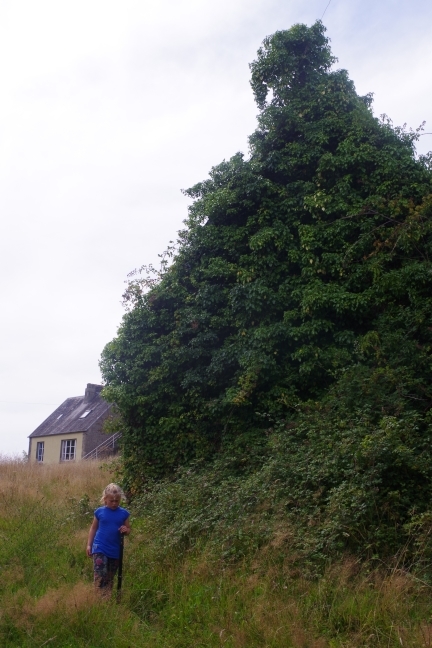 10 years of nature taking over! This is the only property my husband or I will ever own, we both come from renting families, and that sense of ownership is a precious and fragile thing. While we dream of relocating there permanently, we've chosen to leave our children in their schools, so every holiday we make the dash over the channel, (actually under because I don't do boats) to renew our fight with the bramble. Disappearing from my workshop as a one-woman business, and out of internet range, (it stops half-way through the hamlet) continually bothers me. It's still a relatively new situation, my Gemma Textiles business was born around the same time as we bought the land, and I think it's important to me to allow the truth of my life circumstances their space, and make the business work within that. The contradiction of developing a business model that pivots on an 'open all hours' webshop that closes up to six times a year is something I will be exploring in the coming years. There are many things about life in the 21st Century that are totally amazing and life-enhancing, instant messaging, phone-cameras, BBC's 6 music, solar panels (need some of those), but I still think it's very common for square peg people to get pushed into round holes. That's not right or healthy. I hope you, square or round peg, enjoy watching this haphazard journey through the growth of my Gemma Textiles business. Sign up to receive my newsletter so you can hear about all the other steps along the way.